Published in Rafu Shimpo, June 14 and June 17, 1958. 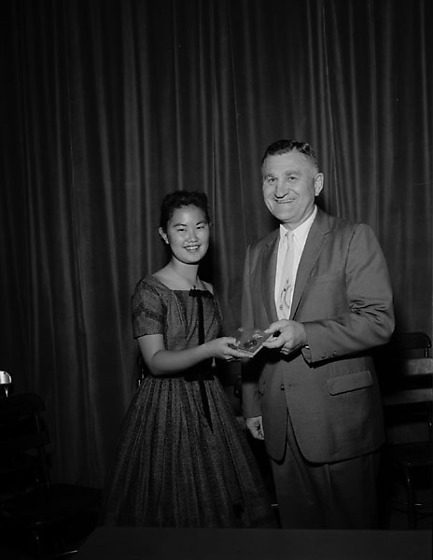 Presentation of Forshay Junior High School medal and American Legion awards to students of Forshay Junior High School in Los Angeles, California, June 13, 1958. 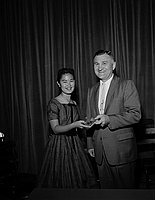 Includes principal Carl W. Handy presenting Kathy Yuba with the Forshay Junior High School Medal, and portrait of winter American Legion medal winner, Setsuko Kihara, and summer American Legion medal winner, Wayne Miyashiro, holding medals and certificates. Typed on original negative envelope: Foshay Junior High -- American Legion Award & Award Presentation. The Forshay Junior High School medal was awarded to the student fulfilling the highest qualities of scholarship, service to school and in personal character. (04.22.2008 cht).